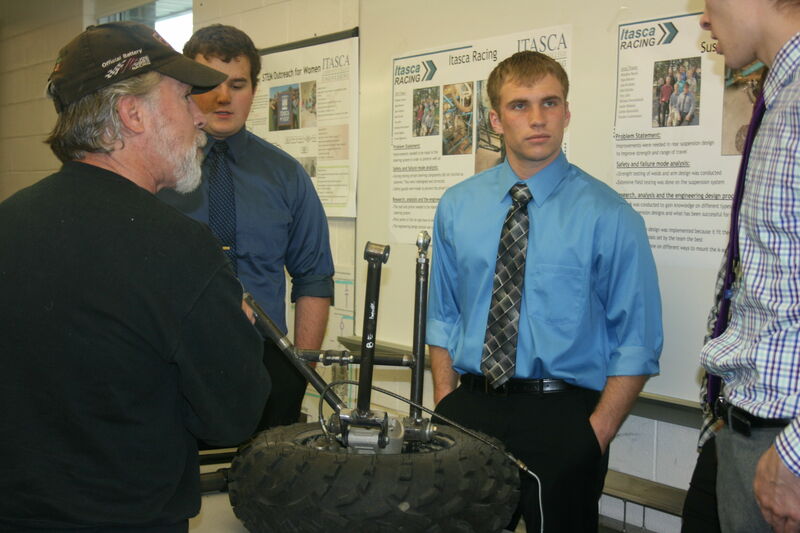 Itasca Community College features the most comprehensive two-year engineering program in the state. 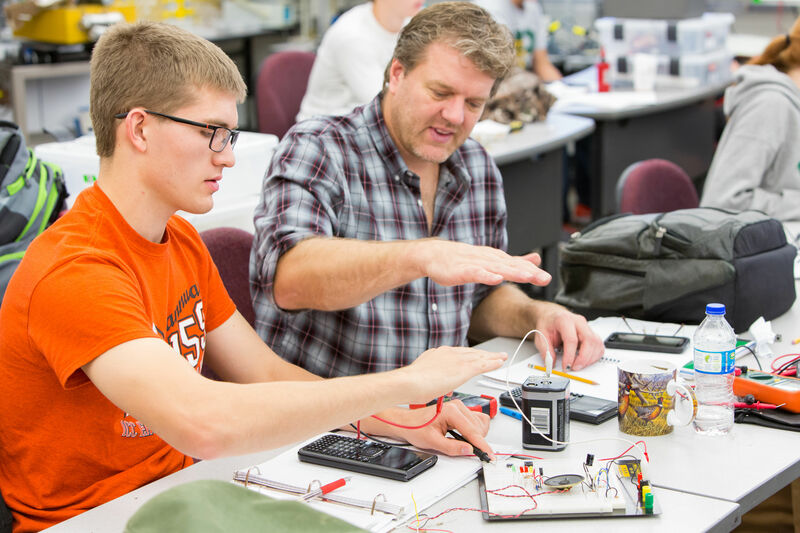 This nationally recognized program provides the first full two years of engineering coursework in an engaging, project-based learning environment. Students completing the program graduate with an A.S. Degree in Engineering and are prepared for a seamless transfer to their chosen university. Students will take a minimum of 31 semester credits in general education, 15 credits of required engineering coursework and a minimum of 14 elective credits from a list of additional engineering, science and math courses. Course selections will vary depending on the student's engineering major goals and the institution where he or she wishes to transfer. Students work closely with instructors and a counselor to ensure completion of the 60-credit Associate of Science Degree and a smooth transition to a four-year university. How do I apply to the engineering program? To enroll as an engineering student at ICC, prospective students should complete the ICC enrollment application. 1. Click the "Add a major program" link midway through the ICC application. 2. When asked to choose an area of study, choose: "Engineering"
3. When asked to choose a degree choose: "A.S. (Associate of Science) in Engineering"
Does the engineering program offer scholarships? We encourage all engineering students to apply for the ICC Foundation Scholarships. The application will be posted on the main page of ICC's website on February 1, 2019. Students that graduated from one of the following schools (Grand Rapids, Greenway, Deer River, Hill City, Northland-Remer, Bigfork, Bug-O-Nay-Ge-Shig, Northern Lights-Warba, Blackduck, Nashwauk-Keewatin, Northome, and home school graduates who lived in the schoool district of one the highschools listed at the time of graduation) may apply for the Blandin Educational Grant. The application opens on October 1st, 2018. 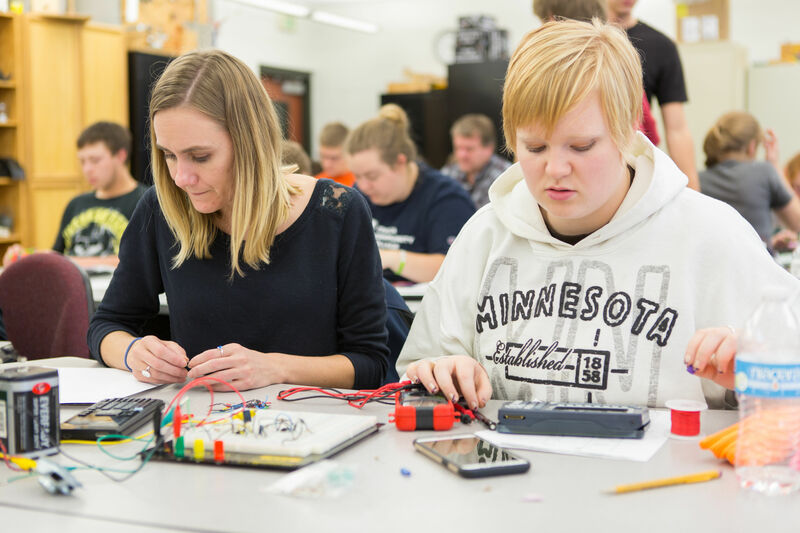 In support of the FIRST mission, Itasca Community College and Iron Range Engineering are collaboratively offering two, 1000.00 merit-based scholarships, to high school seniors who have participated on a FIRST team during their high school career. 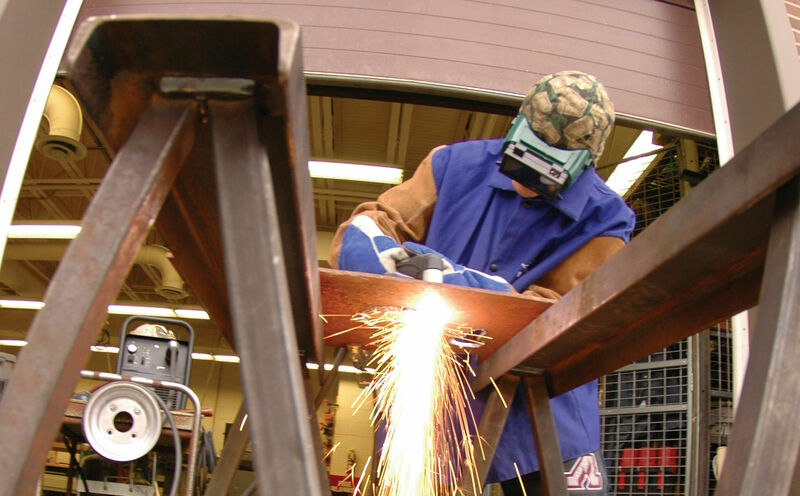 The scholarship may to utilized for undergraduate coursework in the Itasca Community College Engineering Program (A.S. in Engineering Degree) at either the Itasca or Iron Range engineering Campuses. Please use the following link to view the scholarship description, eligibility requirements, and application details. Does the engineering program offer internships? ICC Engineering works with many area industry connections and receives summer internship postings from many of these industries, both in the local area and outer lying areas. When applicable, faculty may recommend a student for a particular position depending on the needs of the industry and the skills and interests of the student. Students interested in pursuing a summer internship should let instructors and program coordinators know of their internship interests and goals. This will help faculty to better assist in looking for opportunities. Will my credits transfer to university engineering programs? Yes. Your ICC credits will transfer to a variety of other institutions. Engineering is a very specific degree where requirements can be different depending on the institution you are transferring to, and the discipline of engineering you are pursuing (mechanical, electrical, civil, chemical, etc). 1. ICC engineering program coordinators and advisors meet on a yearly basis with our transfer institutions to review curriculum transfer and specific courses. 2. ICC engineering students are assigned to a specific advisor, who specializes in engineering curriculum transfer. Engineering students are required to meet one-on-one with the engineering advisor to register for each upcoming semester. This helps to ensure that students are picking the right courses at the right times for a smooth transfer. Is ICC's engineering program accredited? ICC Engineering graduates are transferring and receiving degrees from many ABET accredited institutions. The accrediting agency does not accredit 2-year institutions, so ICC is not individually ABET accredited. What is the employment outlook for engineers? The median annual wage for architecture and engineering occupations is approximately 77,900. Employment in these careers is expected to grow 3% from 2014 until 2024. What do program alumni have to say? ICC Engineering Alumni are a great resource for prospective students. Check out our alumni testimonial page by clicking the button below. Through ICC's Design Sequence students work with campus and community stakeholders to solve real-world problems. 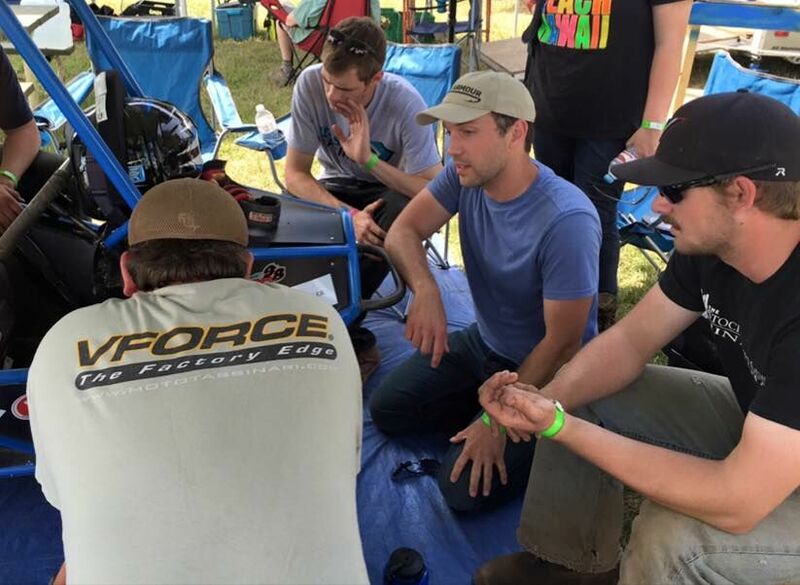 Students and instructors work collaboratively, utilizing creativity and scientific knowledge, resulting in custom solutions to a variety of problems. Past Projects: Campus disc-golf course, STEM Showcase activities, Batting cage redesign, Outdoor ice rink design, Classroom space utilization study, Room schedule display device, Invasive aquatic species prevention and removal, Campus lighting upgrade, Ladder fall cages for OSHA compliance, Elementary Service Learning Projects, and more. Students in the engineering program participate in a variety of high quality project-based and problem-based learning experiences. Professional project management and teamwork skills are developed and practiced throughout the program. These experiences best prepare students for their transferring institutions and experiences in industry. Past Projects: Trebuchet design and fabrication, RC Cars, Custom-made backpacks, Rapid prototyping, Digital sensor design, Stress-strain testing, Scientific lab design, implementation and data analysis and much more. Students at Itasca have the opportunity to live and learn in the same environment with other engineering students. With 24-hour access to Wenger Hall Engineering Center, students work on projects, recreate, study, and relax together on a regular basis. Student activities are a critical part of the living-learning community and allow students to build a network of friends and future colleagues. Engineering Community Activities: Engineering design projects, Engineering basketball league, Canoeing/camping/hiking trips, PI (3.14 mile) run/walk pie social, Transfer University visits, Engineering industry tours, Giants Ridge ski/snowboard trip, SWE (Society of Women Engineers) activities, Engineering Club activities, BBQs and student dinners, and more. Students learn to become high quality college students and professionals through the Engineering Design Sequence. Students will develop time-management, teamwork, and communication skills. They will begin to navigate their career pathway including an emphasis on the ethical responsibility and obligation as an engineer. Students will enhance their professional expertise by developing resumes, cover letter, and interviewing skills through a series of seminars, activities and feedback from industry professionals. Key Professional Development Events: Ethics Conference & Formal Dinner, Mock Interviews with industry professionals, Career Fair Visits. The Fabrication Labs are located in Wenger and Davies Halls. These labs support high-tech wood and metal working equipment for prototyping and finished project needs. Lab management and student work study positions help to foster safety and successful project completion in the labs. Lab Equipment: 3D rapid prototyping machines, Laser cutter & etching machine, Vinyl cutter, 3D scanner, Sewing machines, CNC machines, Wood-working equipment, Metal-working equipment, Welding and plasma cutter equipment. Where do ICC Engineering graduates transfer? While ICC maintains strong partnerships and transfer agreements with the universities listed above, students also transfer to many other institutions across the US with positive results. Fill out a short form and we'll help get you started. Stop by, we'll show you around. Schedule a visit now. Email info@itascacc.edu or call 218 322-2300.